The rising importance of online video is the topic of the day on today’s episode of SEM Synergy. CNN — a media outlet that before a few years ago was best known for its 24-hour television news coverage — launched a newly redesigned site last week. Central to the new design is the prominence of video. On the home page, the editor’s choice of must-watch videos runs across the screen. Head to any category landing page — Politics, Entertainment, Tech, and so on — and you’ll see a number of videos featured above the fold. CNN isn’t the only site looking to capitalize on the presence of video in online properties. A study by social media analytics provider Sysomos uncovers the wide-spread adoption of video embedding by bloggers and overall video viewing trends. I’m already late to the party. Typical. Now, if I’m not alone, let’s back up a second and listen to Bruce’s perspective on why video is an increasingly important element of any site, shared during an interview with ReelSEO, a video marketing and SEO company, earlier this year. Check that out and come right back, okay? Videos are engagement objects™, or elements and applications that cause the user to actively participate on a Web site. Google’s Universal Search highlights the need for videos, images and other engaging content as such features are featured prominently in page-one search results. My guest Topher Kohan, SEO coordinator at CNN, talked to me during the podcast about CNN’s Web 2.0 strategy, what the process of redesigning the site was like, and how he managed to keep SEO in the loop from the very beginning. One point that really stuck out to me during our convo but didn’t get a lot of time during the podcast was CNN’s approach to the Web, not as an alternate channel, but as a critical appendage of the holistic-minded media organization. 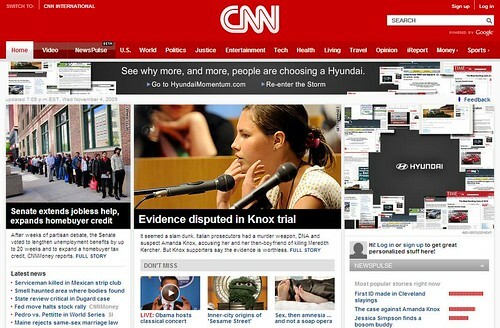 While some news organizations push Web visitors to the television, CNN sees Web users as an influential audience, deserving of at least the same amount of time and effort as is given to catering to TV viewers. As a television news org, CNN has a lot of video in its archives. If users can find, view, and share video online, and all those interactions can be tracked and measured with unprecedented accuracy, isn’t online video an investment worth at least investigating? Retailers are facing the same situation. Once upon a time Web site visitors could be directed to call or visit a brick-and-mortar location. The Web was a tool for funneling people down a non-Web-based conversion cycle. But business models have necessarily evolved as confident shoppers aren’t going to put in the time and effort it takes to bounce from your site to the store when an online alternative is available. The Web is no second-class citizen, and video holds a high place in the court of the king. Get the picture? Hey, that’s great!! Its good to see CNN moving ahead!!! News is widely gaining popularity, with its wide network. aside from having a great video content, i think right video optimization must be done to make it searchable. one step is by sharing and linking videos to social media sites. Thanks, Alan. I agree. Popular content and breaking news can pretty much never overlap. The issue you mention is a usability issue that may have lost out in an attempt to please the masses. I think it’s great that CNN is showcasing video more. At the same time, I think the new CNN, which is “most popular” centric shot themselves in the foot at the same time as they chose to adapt to the new video reality. It’s now infinitely more difficult to find the most recent articles without multiple clicks that bombard the user with “most popular” results. I think the key is really to adapt and evolve but not to alienate existing readers, and in that light, CNN falls short.